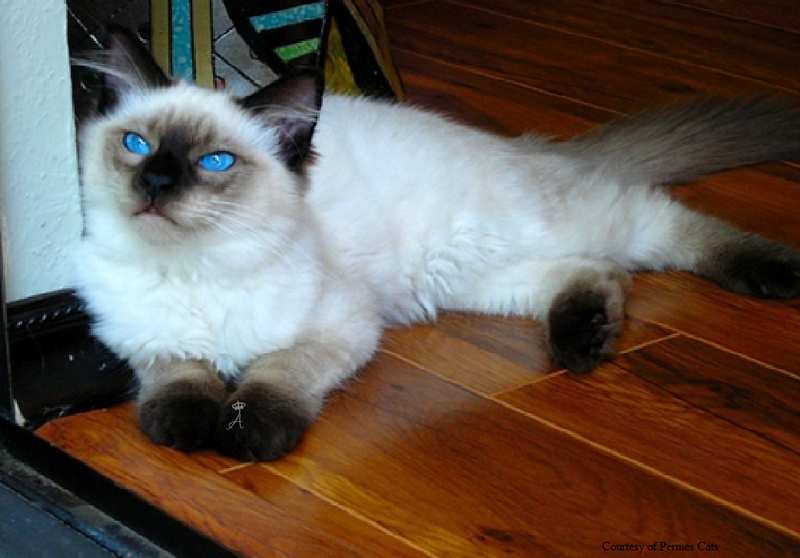 The Balinese cat breed is a beautiful, rare and majestic cat breed. The Balinese cat is a natural mutation of the Siamese cat breed with blue eyes, silky long-hair, companion-dog like personalities, and hypoallergenic qualities not common in its short-haired Siamese counterpart. Balinese cats are referred to as the True Long-haired Siamese cat. The Balinese breed was primordially established by the use of controlled breeding so to preserve these beautiful and rare qualities only seen in the Balinese cat breed. The Balinese cat is a cat that has been admired by many due to its personable disposition and intelligent demeanor. Many do not imagine a cat being so personable like a dog, but these cats are the talk of the family. They are considered one of the most intelligent cat breeds according to Barron’s Educational Series book, The Encyclopedia of Cat Breeds written in 1997 by J. Anne Helgren. 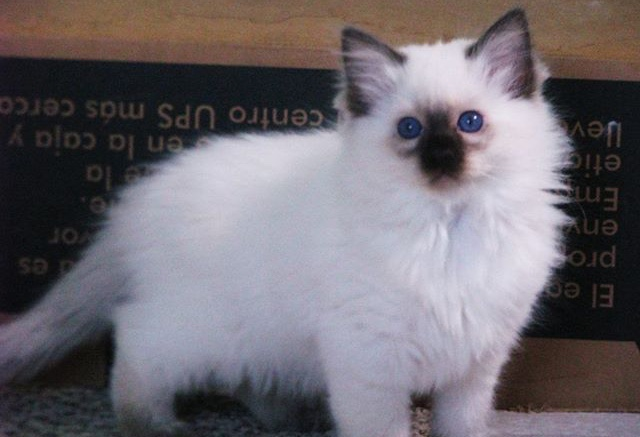 With it's beautiful sikly long-hair, blue eyes, and various color points such as the traditional Seal, Blue, Chocolate and Lilac points; the breed has obtained much interest and popularity by feline lovers as well as allergic cat lovers, who desire a cat that is Genetically Hypoallergenic. The Balinese cat becomes the perfect cat due to these qualities, and the fact that it is a natural cat breed, not a human created cat breed like some currently marketed as "pure-bred" cats. 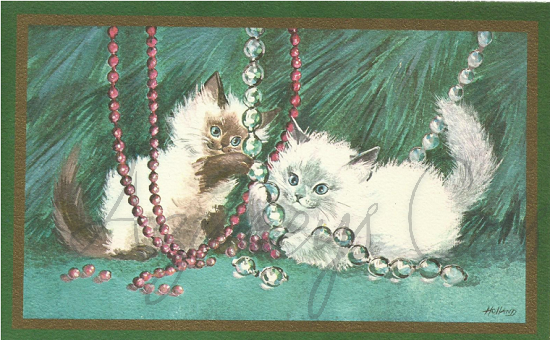 The Balinese cat breed makes out to be a loving companion for life, and a fountain of many cherished moments. As you share your time together, you will much acknowledge it's significance of being the rare long-haired Siamese cat that almost became a non-existant cat breed. The Balinese cat is as old as the Siamese in terms of existence but was first acknowledged in documented Siamese litters in early 1900s, but not considered a breed until many years later. To better understand the Balinese breed, we need to mention that Siamese cats were first introduced and bred in the United States around the late 1800s. During this time, Siamese cats were a relatively new breed to United States cat breeders as well England cat fanciers. This could explain the lack of awareness towards Siamese cats that carried the rare long-haired gene that produced long-haired offspring in certain litters. Purebred Siamese breeders of that time, saw these long-haired versions of the Siamese as "faulty" cats or undesirable due to their natural and recessive long-haired gene; after all, it didn't meet the current Siamese breed standards which specified requiring short hair. 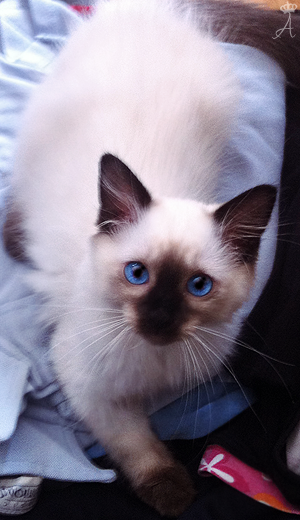 Balinese kittens rarely appeared in Siamese litters. Breeders initially bred two long-haired Siamese cats and realized they would breed “true", which meant that they would produce offspring that were also of the long-haired appearance and standard. By these cats breeding true, it meant that they could be considered a breed in itself and not a hybrid or “mutt” cat. 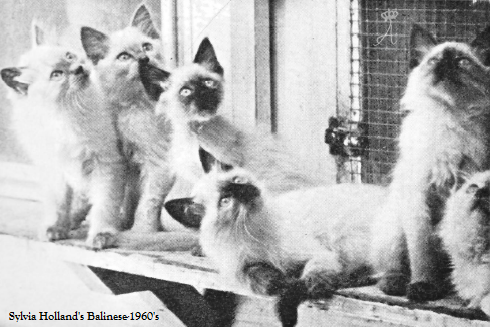 In the year 1928 a Siamese breeder registered a long-haired Siamese cat through the CFF (Cat Fanciers Federation). 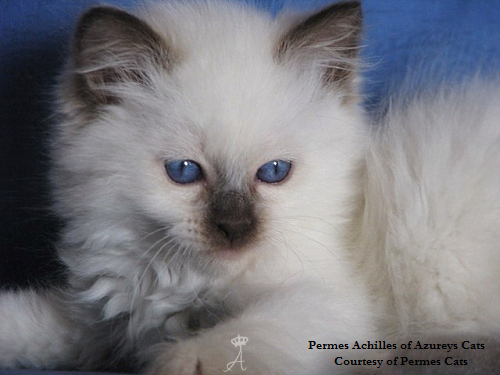 This was the first and only record found during this time of a long-haired Siamese or a Balinese cat. 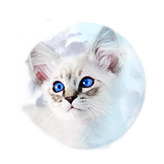 Breeding of the Balinese cat and the establishment of Balinese cat breeding programs began many years later with the beginning efforts of three hobbyist breeders here in the United States. 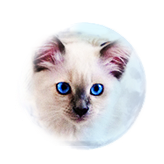 Marion Dorsey of Rai-Mar Cattery in California first started breeding Balinese cats in 1955 with the goal of establishing the long-haired Siamese cat breed. She would by occasion get long-haired Siamese kittens in her Seal point Siamese litters. She then started line breeding her long-hairs so to produce the more Long-hairs, due to the long-hair gene being rare and reccesive. In the 1960s, Helen Smith of MerryMews Cattery, another breeder in New York, started breeding these lovely cats to establish the breed in the northeast, and both breeders worked together in accomplishing that goal. 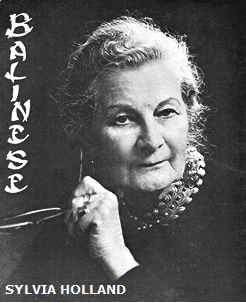 Helen Smith is famed for giving the long-haired Siamese breed its name; Balinese. She was inspired by the breed’s gracious movements appearing as a long, feathered, or ermine coat giving resemblance to the Asian Balinese dancers of the time. In 1965, a third breeder named Sylvia Holland came into the picture. 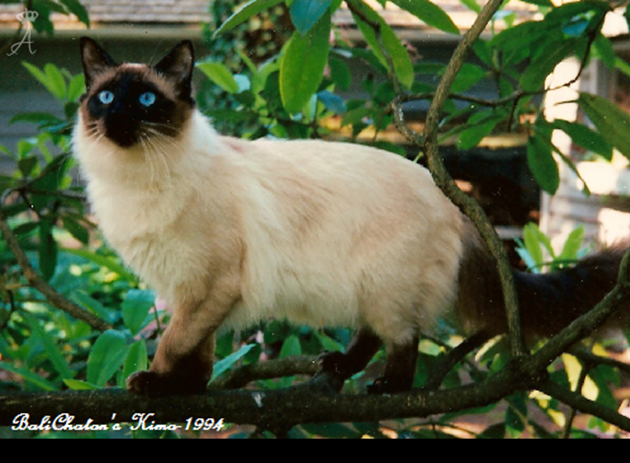 Sylvia Holland very much fell in love with the Long-Haired Siamese; Balinese cat breed when visiting The Jewel City Cat Show in Glendale, California in 1956. 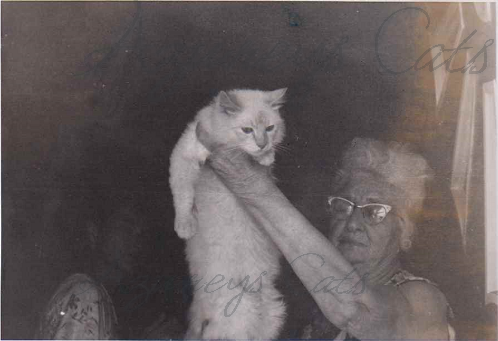 She acquired her first Balinese cat from Mildred Alexander who ran Mrs. Alexander's Cat Motel in the early 50's. 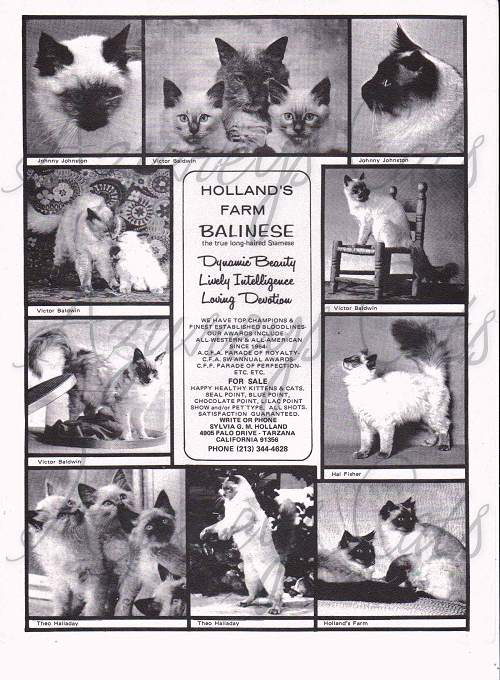 In 1965, Marion Dorsey sold her cattery named Rai-Mar Cattery to Sylvia Holland of Holland’s Farm Cattery, which is when Sylvia Holland embarked on a journey to produce Balinese cats of a set type and standard by initially inbreeding Dorsey's cats to produce a pure and set lineage for the Balinese breed. 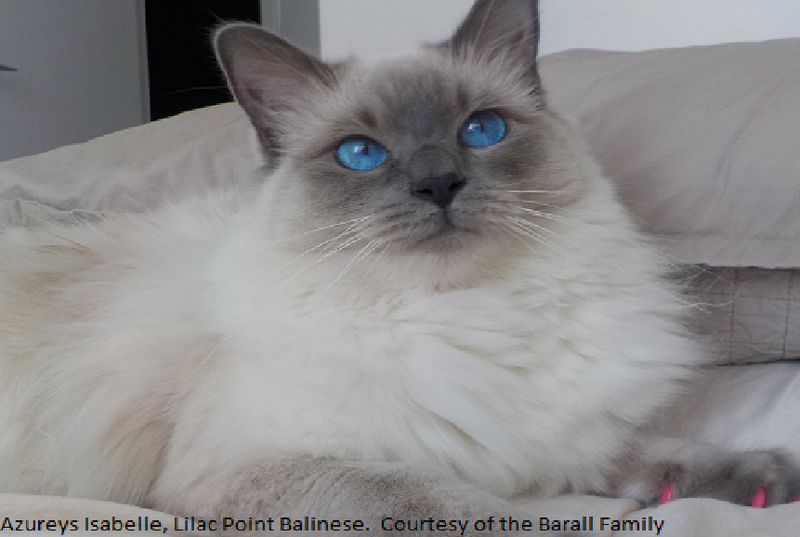 Sylvia Holland was the initial promoter of the Balinese breed in it's 4 traditional colors; Seal, Blue, Chocolate and Lilac points. 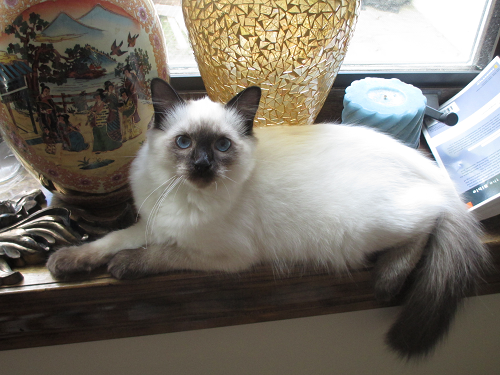 She was a strong advocate in having Balinese lines come from well established foundation cats which included lines of pure Siamese background, long-haired and full body type. She did not like the idea of "new age" breeders in the production of other color points due to the loss of pure lineage, and corruption of the lines that she helped established. She as well felt that the practice of breeding the Balinese cat breed back to it's parent breed; the Siamese, would produce inferior cats of appearance and standard due to the recessive long-haired gene found in the Balinese breed. Though this type of breeding is currently allowed, it does produce cats that do not have the same type and standard presented by Sylvia's cats, such as the very long hair, body type and personality. 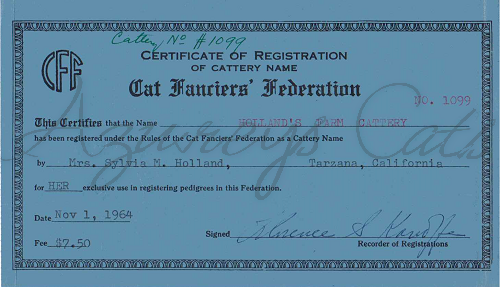 Sylvia Holland worked effortlessly to promote the breed's recognition by many cat registries, including the CFA. 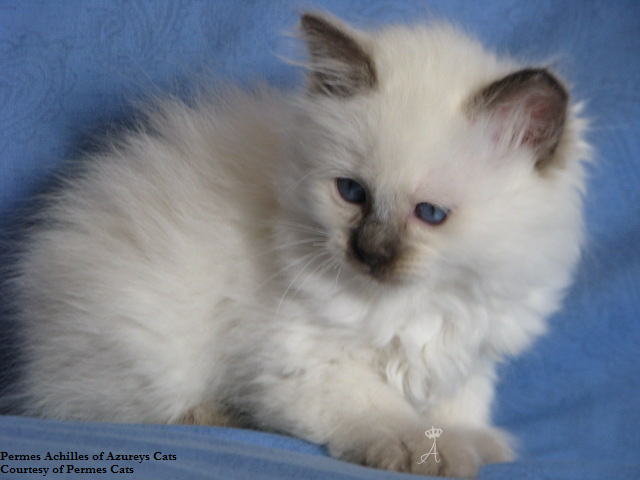 From then on, many Balinese breeders have tried to preserve and improve the lines already established, though some standards, and lines currently seen in the breed do not reflect the true ideal of Holland's Balinese cats. Sylvia Holland passed away on Easter Sunday in 1974. Only a few present breeders share this same dream of the founder of the breed, and will continue to strive to preserve this wonderfull breed. Without these initial efforts by these pioneer Balinese cat breeders, the True Long-haired Siamese cat could have been lost forever. To view more about the history of the Balinese breed, please check out the 1971 CFA Yearbook. As Old-Style Balinese breeders, our goal is to preserve the breed in its initial standard and the many records pertaining to this beautiful breed. Old records and archives are not easy to find or acquire, and can be lost completely in time if not preserved. 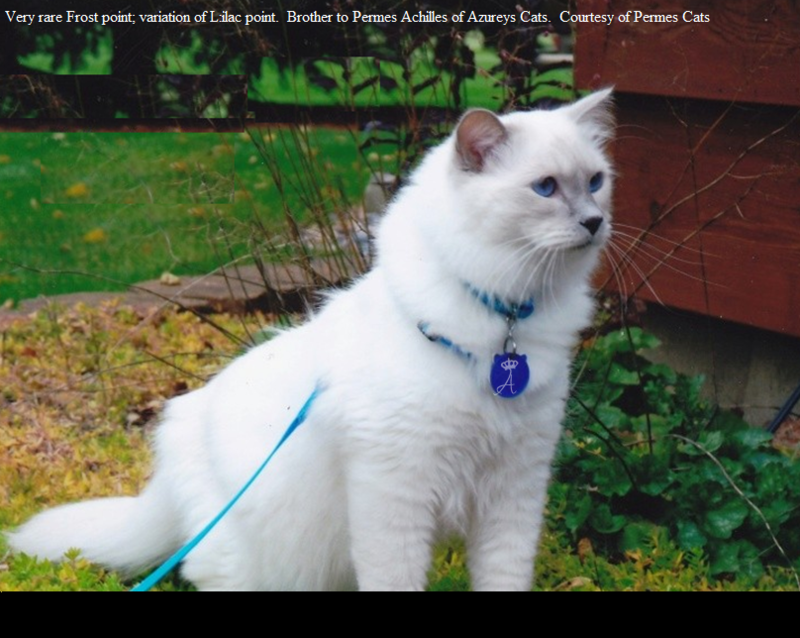 In this page you will find many interesting and fascinating documents on the Balinese cat breed that are very rare, including some documents/records preserved by Balinese breeder historian, Mary Desmond of BaliChaton Cattery in Washington State. 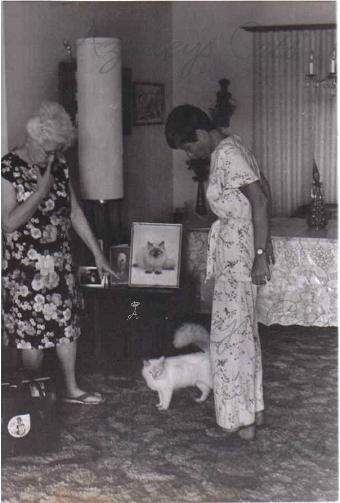 Mary was entrusted many original documents and pictures of the Balinese cat breed by Sylvia Holland herself, and Theo Halladay, Sylvia Holland's daughter. 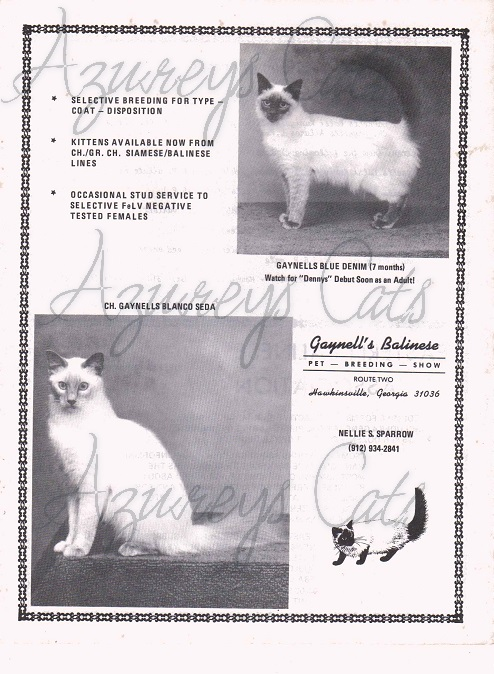 Mary has now entrusted us with these beautiful archives on the Balinese cat breed. Many of these documents will/can not be found anywhere else but here at Azureys Cats. 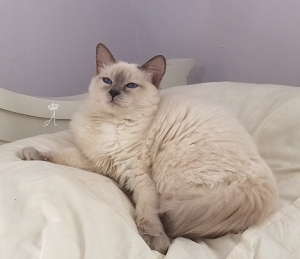 Thank you Mary for helping preserve and promote the Old-Style/Traditional Balinese cat breed! Balinese Theory: Long-haired gene, and hair quality? 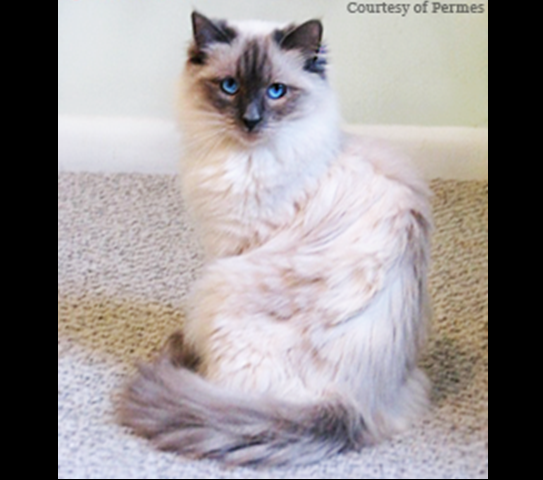 There are some theories as to why the long-haired gene is present in many Siamese cat lines. 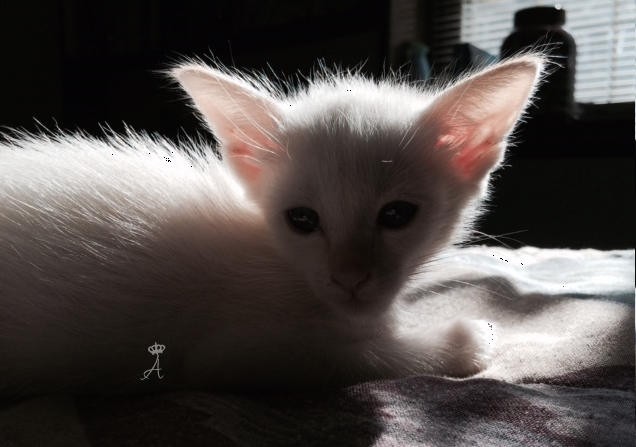 Some believe that it might have been an old cross between a Siamese and a Turkish Angora that caused the presently long and hypoallergenic coat. 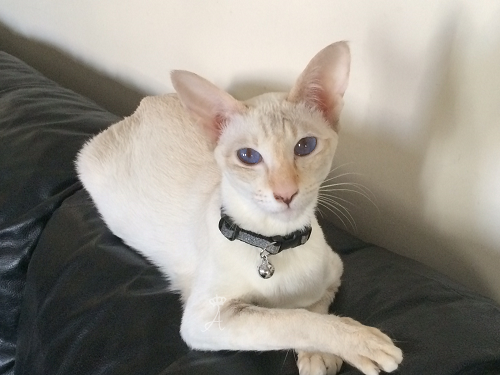 Others believe that the Balinese is just a naturally-occurring mutation in the Siamese after much crossing and breeding. This can occur due to the many genetic possibilities within a cat's lines beginning from the domestic cats ancestor, the African Wildcat, or in this case, the Asian version of the Wildcat, the Pallas cat that had long hair. There is some argument that certain pictures of old show-quality Siamese showed some of these cats with longer than usual hair. The theory is that it is a natural genetic mutation that occurred many years ago. The long-haired gene in the Siamese, being recessive (meaning a cat needs one from each parent), increased in rarity as past Siamese breeders would keep Siamese cats that were thought to not have the long-haired gene in their breeding program or keep only "true" Siamese cats. This further decreased the chances of having long-haired Siamese in their purebred Siamese litters, and avoided problems for the breeder in them producing non "purebred" Siamese cats that carried this gene and long haired trait. 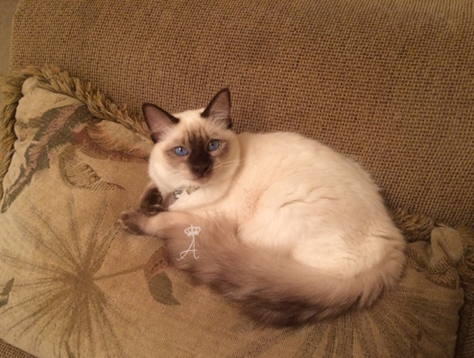 I don't believe that it is a cross between a Siamese cat with an Angora cat for several reasons. Even though the Turkish Angora is said to be hypoallergenic; thus passing on this quality to the Balinese, then some Siamese or Balinese cats would also have green eyes or bi-colored eyes due to the Turkish Angora having the genetics for these qualities that could have also been passed down to the Siamese or Balinese breed. 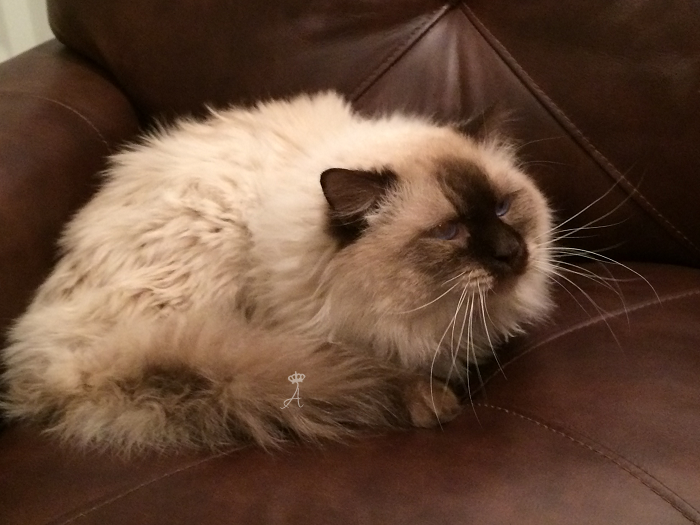 The "fur" or	hair of a Balinese cat is as soft as silk, and even compared to rabbit hair due to its softness. The Balinese cat like any other animal; including humans, does shed but it is not a type of shedding that is problematic or of a concern. 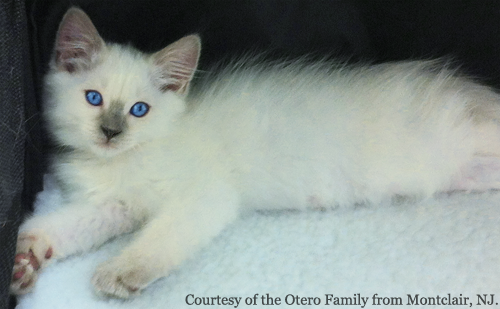 Due to its quality and of it being silk like, the hair of a Balinese cat should not tangle nor get matted. The true Balinese cat is in fact a long-haired Siamese cat. From its beginning roots in being discovered through Siamese cat litters, the Balinese cat was always seen and regarded as a long-haired cat. Though it's long hair is not as long as other cat breeds, its quality is very different as noted above. 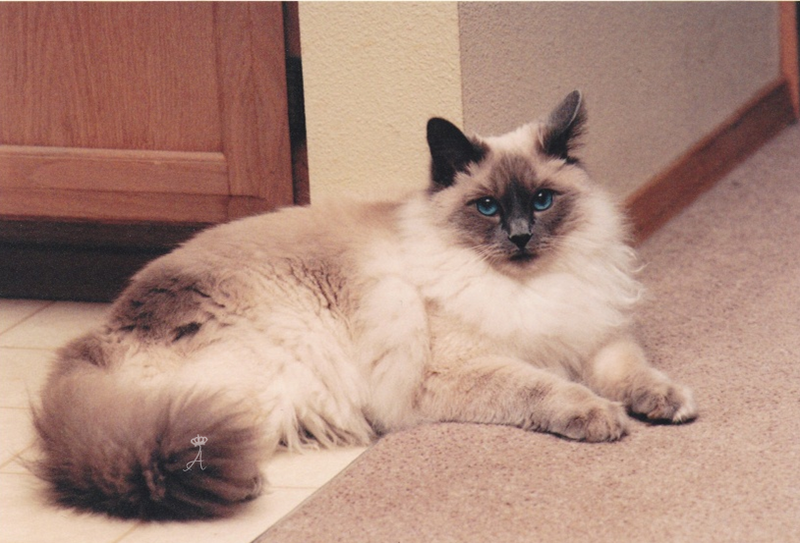 Many breeders have argued as to how long a Balinese cats coat should be. 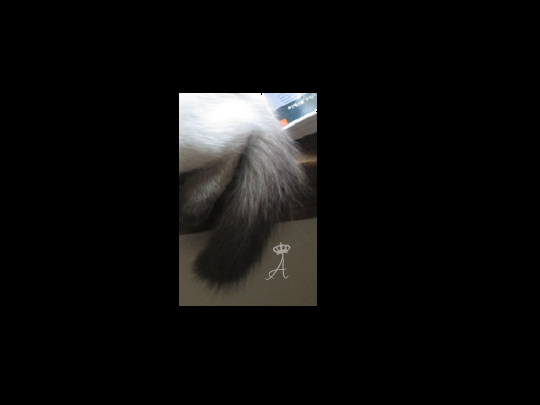 Some say it is anywhere from 1 1/2" to 2" in length; with others such as Modern Standard Balinese breeders saying that only the tail should have hair and the rest of the cat being slim textured like the Siamese. If we note the initial and foundation cats of all Balinese cats; including Sylvia Holland's, we notice that the Balinese cat's hair did vary in length, but all her cats were...long-haired! They had long-hair not only on the tail, refered to as a plum tail, but they as well had hair around their body. 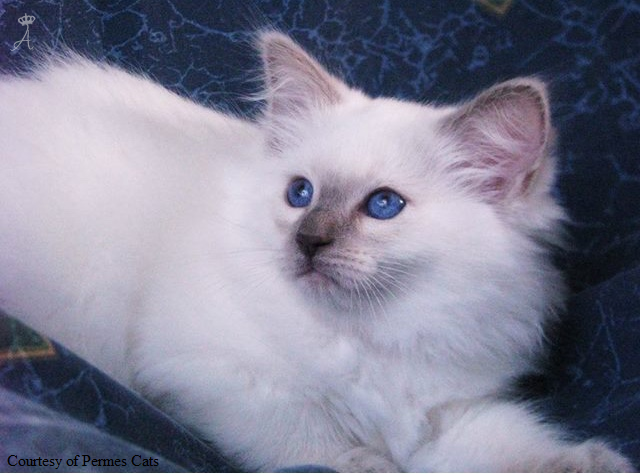 Many breeders, seem to forget the above and do not realize that a Balinese cat is long-haired. What has happened over the years, is that due to declining new blood found in the Balinese breed, some breeders have had to outcross with the Siamese cat breed, which is very acceptable and normal, but they sacrifice many qualities, including that of the coat quality and length. This can be noted among many different past and current breeding lines. 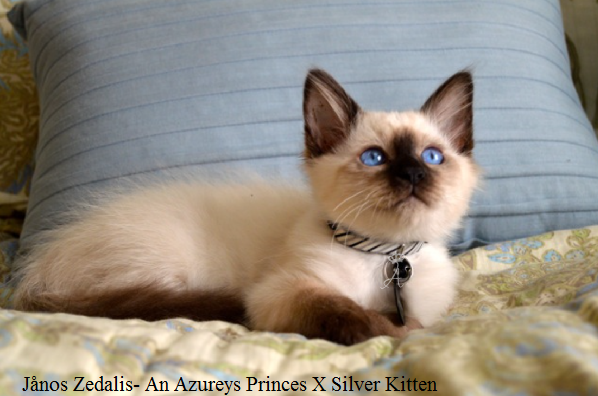 Our goal at Azureys is to produce Balinese cats of very soft and long-haired quality. This can only be done by allowing Balinese to Balinese cat breedings. Though it can be possible to get good quality and length of hair through a Siamese cat and Balinese cat breeding, there is no guarantee. 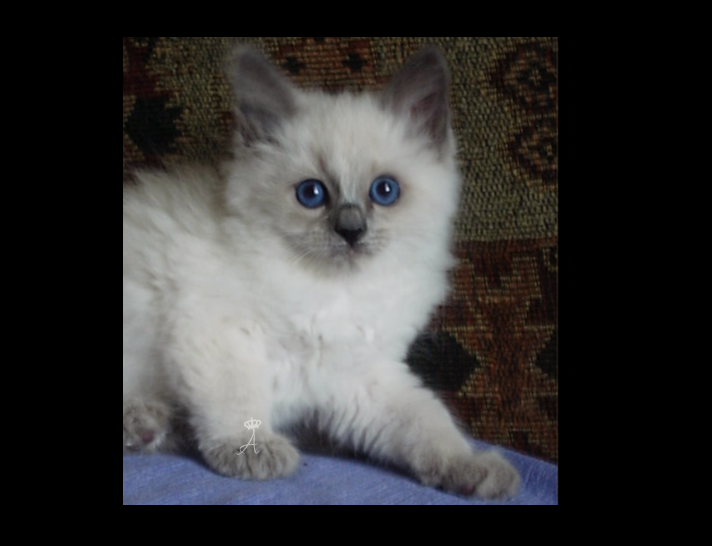 This once more is the grand responsibility of breeders having to preserve breeding lines, and old and new Balinese cat outcrosses from Balinese to Balinese cat breedings. 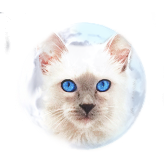 As a Balinese cat breeder that specializes in the true Balinese cat breed, we at times breed and produce Siamese variants or what we like to refer to as short haired Balinese. 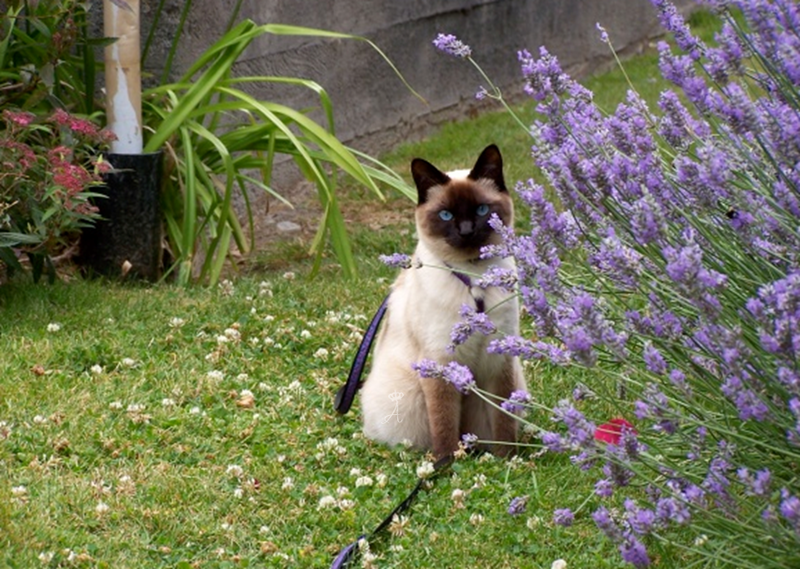 Though the Siamese and Balinese are considered the same in one breed, there are obvious differences between the two. 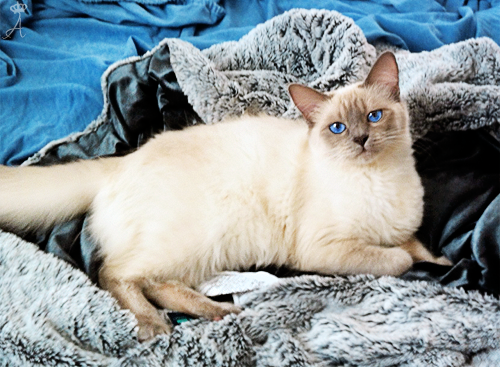 The Balinese has soft long hair, their coat does not shed in the amounts like the Siamese does and Balinese cats are hypoallergenic when Siamese cats are not. A true Siamese cat is bred out of a Siamese to Siamese breeding but when a Siamese is bred to a Balinese, their kittens are to be registered as a Balinese cat due to its Balinese lineage. 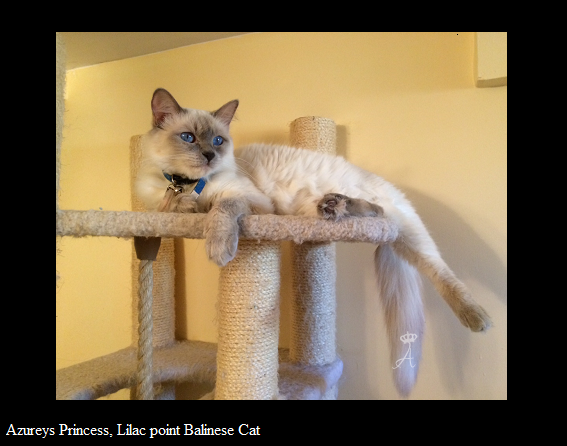 Some cat associations such as CFA will only register cats as Siamese if they have 4-5 generations of only true Siamese, no Balinese cat lines in their background. 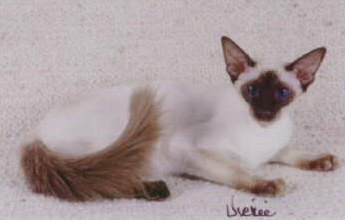 Being that Balinese cats have the long haired gene, when bred to a Siamese, it will pass down one strand of the long haired gene allowing for some of the trait differences to take place in its offspring including its long haired traits but no long haired kittens would be produced as it take two parent cats with at least one 1 strand of the long haired gene each to produce a long haired kitten, hence a Balinese. This is also the case when a breeding takes place with a short haired Balinese and a Balinese; long haired. Since it carries only one strand of the long haired gene, they would either produce kittens with two strands of the long haired kittens gene, one from each parent making the kitten long haired, or one strand of the long haired gene making the kitten a short haired Balinese. 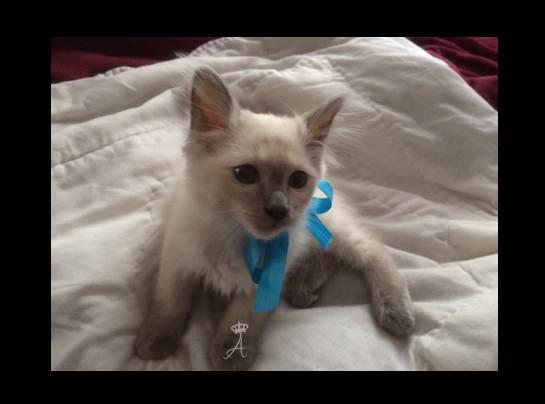 With regards to all this, these short haired kittens produced are properly referred to and differentiated as Short haired Balinese or Siamese/Balinese variants as they carry one strand of the long haired gene and are somewhat different in traits than that of a true Siamese with no long haired gene or Balinese ancestry. A short haired kitten out of a Balinese breeding is a short haired Balinese by distinction. 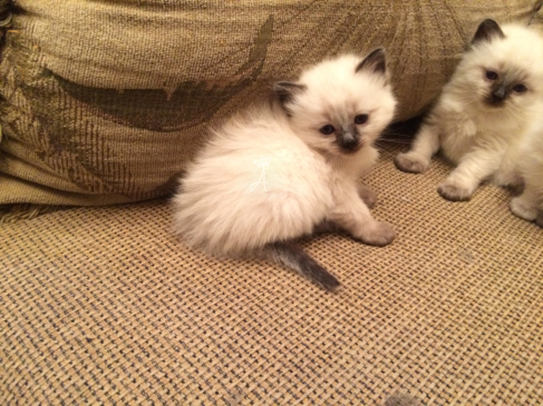 They have a different coat type and quality than that of the Siamese. Siamese have short prickly hair that does shed more than that of their long haired counterparts. It astounds many in regards to this since people think that due to the Balinese being long haired it would shed more when that is not the case. Siamese have a thick type of hair which prickles out when petted thus shedding more. 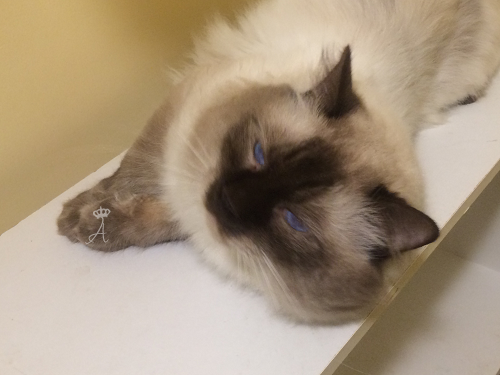 The Balinese and short haired Balinese on the other hand have a very soft coat that does not shed in high amounts and it's silky hair aids in the care of its coat which requires minimal grooming and maintenance unlike other long haired cat breeds who's coat can clump and needs daily grooming for maintenance. Short haired Balinese have the short hair length like the Siamese but with the coat quality of the Balinese. In terms of personality, some Short haired Balinese cats take more from their Siamese lines and some might take more from their Balinese. For example, a Siamese by nature will be a vocal cat, more so than the Balinese. Some Short haired Balinese can be less vocal taking more of their Balinese side. Siamese and short haired cats seem to also be more active in the sense that they will jump and run all around which goes along with their athletic tubular bodies but there are some that are not as active taking more of that personality trait from the Balinese. Generally, being that they are Balinese by genetics they have the same outstanding personality and high intelligence as their long haired counterparts. These factors and more can vary among breeding lines and personality traits from a cats parentage. The Balinese cat is genetically hypoallergenic in which it is less likely to produce an allergic reaction to those allergic to cats due to the lesser amounts that they produce of the protein allergens that trigger allergic reactions. 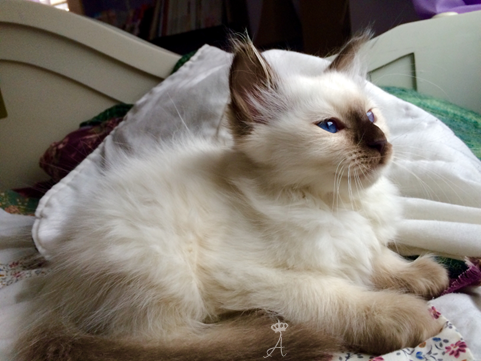 This same trait is passed down to their offspring and the more Balinese lines a kitten might have, the higher the concentration and probability of it being hypoallergenic. 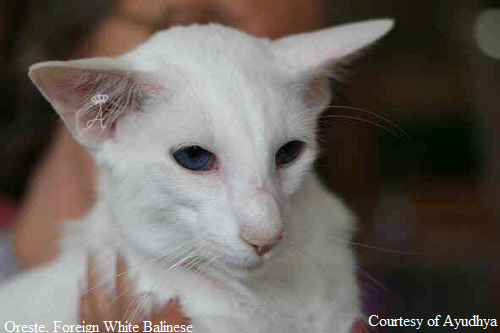 This same applies to the Short haired Balinese in that it can be genetically hypoallergenic due to its Balinese lineage, compared to the Siamese which are not genetically hypoallergenic. 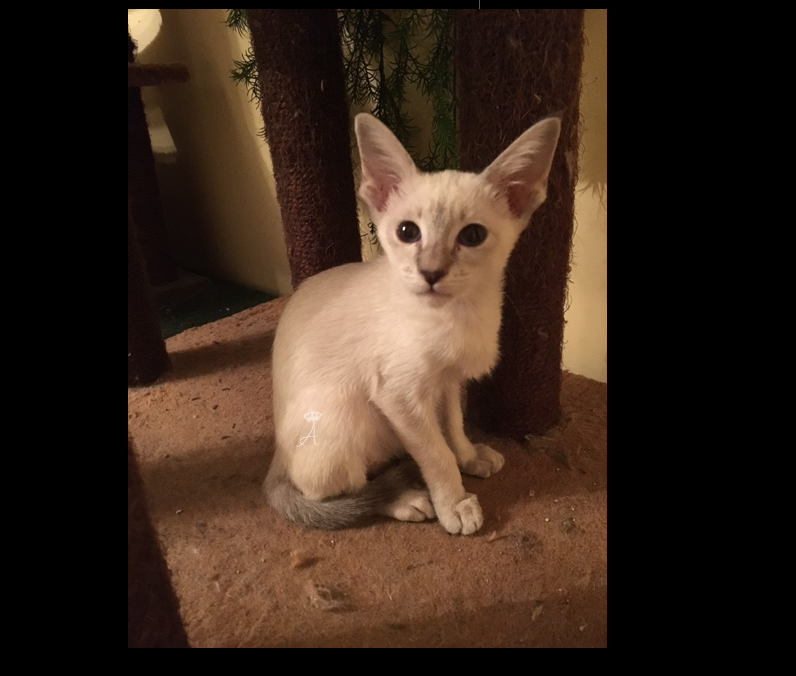 We have produced short haired Balinese that have gone to homes with individuals that are allergic to cats and are not affected by their Short haired Balinese cat. You can see this in our websites reference page. Though this might be the case, allergic reactions do vary and there are many factors involved in that of an individuals allergies. For that reason if someone is extremely allergic to cats, a Short haired Balinese might not work for them but a True Balinese out of a Balinese to Balinese breeding might. Though the main difference between these two cats is that of the coat, for some, acquiring a Short haired Balinese cat might be the best option for them if they prefer the short hair and look of the Siamese but the traits and hypoallergenic quality of the Balinese. In all reality though, it is a matter of preference in what you might have in mind regarding your interest in a kitten/cat, along with that of the hypoallergenic trait if that might be an important factor to the individual. For the past decades, there has been some argument and debate as to the actual standard of the Balinese cat breed, like that of the Siamese. 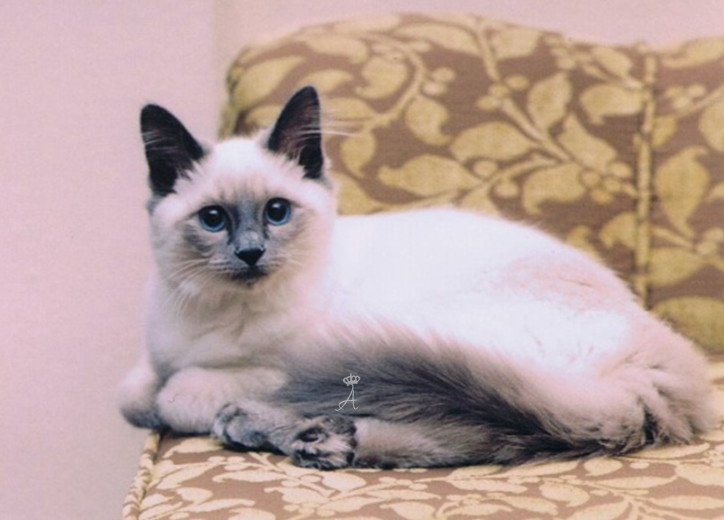 Currently, there are many confusing terms applied to the Siamese and Balinese breed and they include: old-style, traditional, classic, apple-head, and modern/wedge-head. If we look at ancient texts and past records, the Siamese and Balinese cat’s appearance was that of the “old-style” or traditional appearance. When they first emerged as a cat breed in the United States coming from England, Thailand, and nearby Asian countries in the late 1800s, these cats were full in head and in body appearance. 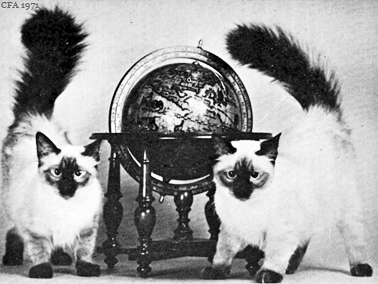 The Balinese cats bred and promoted by Marion Dorsey, Helen Smith, and Sylvia Holland, were also that of the full appearance with rounded heads that resembled the presently recognized-style/traditional or apple-headed appearance. 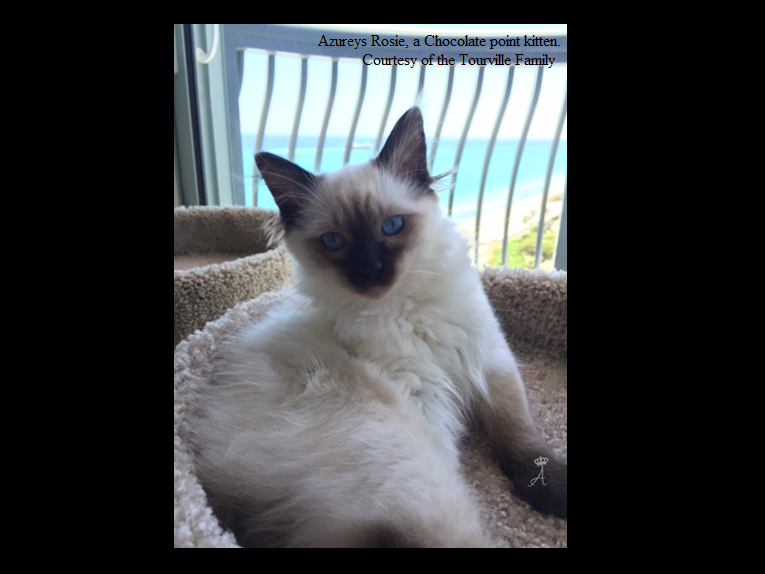 Nowadays, we're seeing Siamese and Balinese cats with a different appearance due to the support of cat registries who find the new modern look appealing. 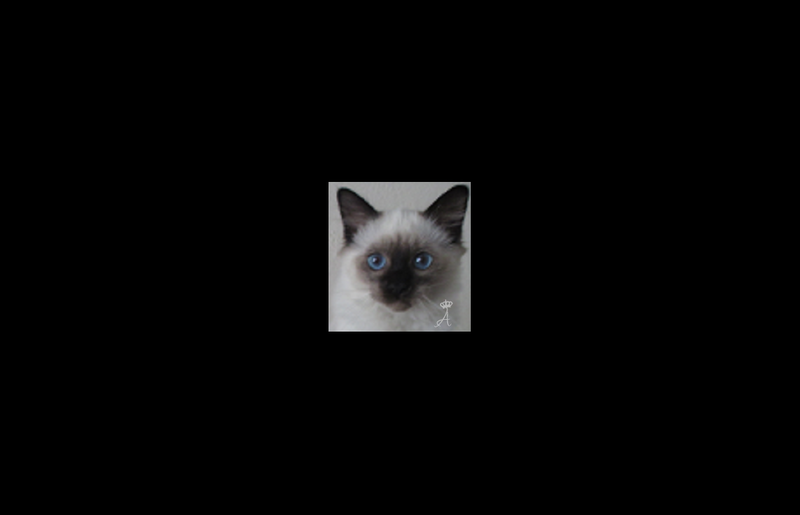 Modern or “wedge-head” Siamese/Balinese cats are currently the face of many cat registries here in the United States and in Europe, where we can often see them at show rings. 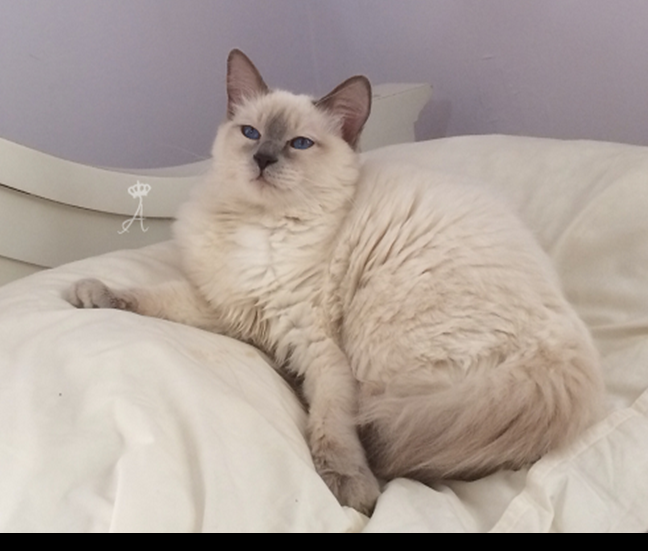 In order for a traditional Balinese cat to be considered for or enter a show competition, they would need to compete through the Household Pet Class; what a disgrace for a purebred cat breed! No offense to the wedge head breeders; but the wedge-head cats we see today honestly don't resemble even close to the appearance of the old-style cats of Siam (present day Thailand), but have been widely endorsed by past and current Siamese/Balinese fanciers wanting a “different and more modern” look. 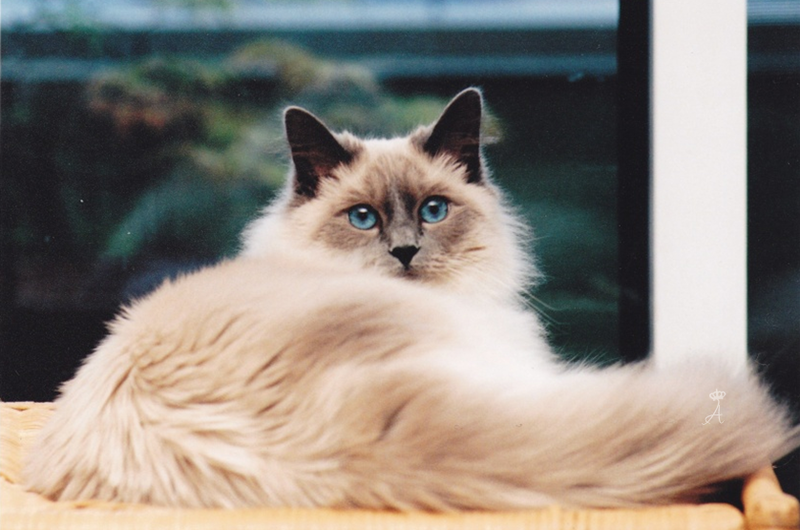 As an old-style/traditional Balinese cat fancier and breeder, my only concern with the modern look and the support given by these cat registries to this breed standard is that we could have already lost and could still lose this wonderful and unique cat breed in its original standard. If it weren't for the matriarchs of the breed like Marion Dorsey, Helen Smith, Sylvia Holland, and the continuous efforts of past and current breeders, we wouldn't have the Traditional Balinese we have today. For this reason, it's this grand responsibility on traditional style breeders that this breed doesn't disappear in the future, and this makes the difference between a reputable breeder and mediocre one. 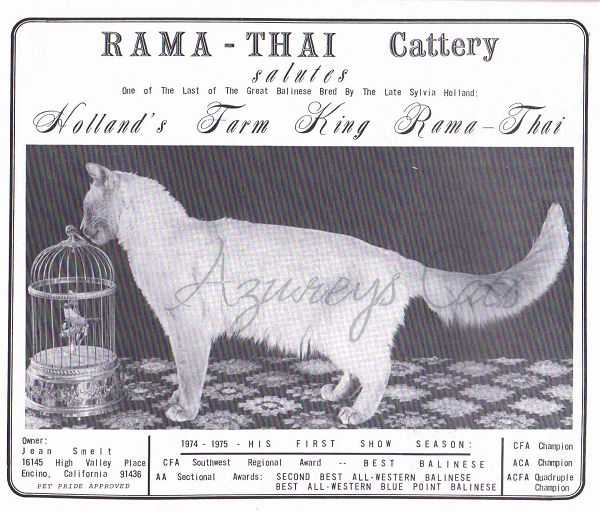 These “terms” or classifications are one of the same, in which past Siamese breeders implemented them to differentiate the Siamese type that resembled that of the first Siamese cats that were imported from Siam or present day Thailand. These are used differently by breeders but they are supposed to mean the same thing. These cats are fuller in body features, and are rounder with their heads resembling that of a proportioned apple, thus the term "apple-head." Some people, including breeders, believe that the apple-head style signifies that these cats that were mixed with short-haired cats to produce its head shape and overall rounded facial features. This assumption can easily be proven wrong when viewing old pictures of the real and true Siamese cats that entered England and the United States in the late 1800s. This term for the Siamese was used for those breeders who wanted the slender bodies of the Siamese without the extreme wedge-head of the modern Siamese standard. The classical standard also comes more into relationship with that of the old style/traditional Siamese in which they also look like that of those cats brought in from Thailand. The only difference between the old-style/traditional standard and that of the classical is that of a less rounded face and more slender bodied appearance in the breed, thus always being considered the “middle” standard, between the two extremes of the breed. I like to consider the classical standard closer to the old style/traditional standard and believe in either the left or the right standard; left being the wedge-heads/moderns and right being the old style/traditional. 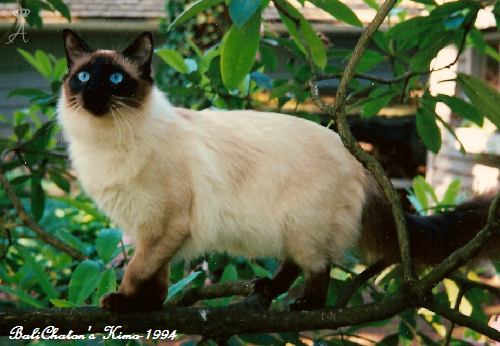 The modern Siamese appearance was produced by Siamese breeders who felt that the standard closely “resembled” the initial cats brought in from Siam, present day Thailand. This standard is fairly new as breeders worked to produce a cat with an extreme, wedged face, large ears and a slim body. These cats started appearing roughly around the mid-late 1900s. This standard is known to be a more delicate and fragile cat because of its type, and by experience many breeders can confirm this. 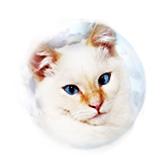 Much of this standard was advocated to represent the Siamese and even the Balinese breed, which is why many cat registries use this standard and you will only see Cat Show Siamese/Balinese cats of this standard, as Old-style/traditional cats are forbidden. For this reason, many Old-Style standard breeders and fans have a difficult time showing their cats or representing the breed because of the registries standards. The only cat association to remain with the Old-Style/Traditional standard is CFF at this time, with TICA attempting to bring back the standard through the nonsense of terminology of "Thai". Many people when they search for the Siamese cat of their youth cannot seem to find or become very confused when they see how the cat type they once cherished has changed in standard because of cat registries and modern style breeders. There are only a very few breeders that still breed and produce cats of the Old-Style standard which mainly resembles the true Siamese cat that was first imported to England, and then the United States in 1800's. 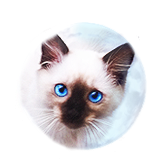 To see all the colors of the Balinese and Siamese cat breed, please visit our: Balinese Cat Colorpoint & Description Gallery ""